On March 8th, 2018, Canadore College is proud to announce its celebration of women all over the globe. International Women’s Day is a worldwide event that brings awareness and appreciation to women who inspire and make their voices heard for various causes from all around the world. The theme for this year’s International Women’s Day is #PressForProgress. So the question then becomes, how will you #PressForProgress? On internationalwomensday.com they list several tasks that you can do to press forward and make a change, such as: maintaining a gender parity mindset, challenging stereotypes and bias’, forging positive visibility for women, influencing other’s beliefs/actions, and celebrating women’s achievements. 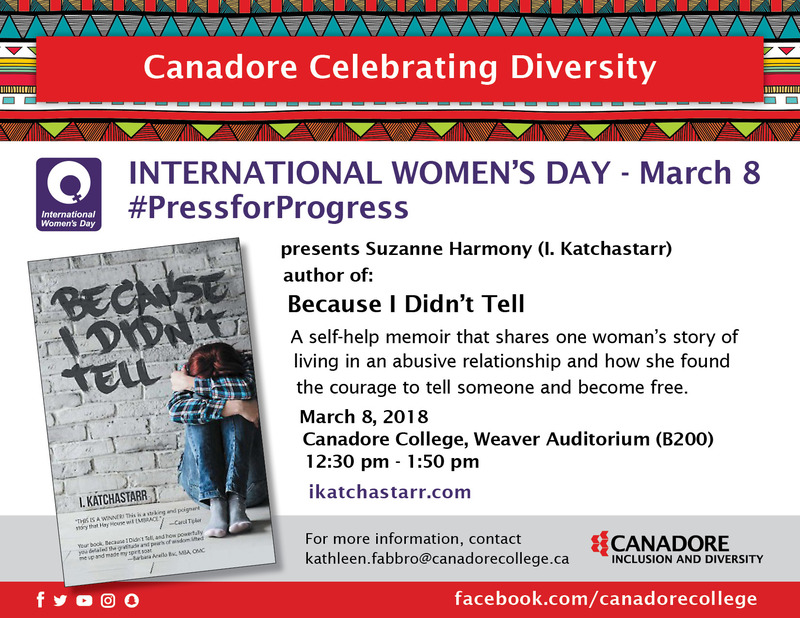 Canadore College is also pleased to announce that Suzanne Harmony (pen name I. Katchastarr) who is the author of Because I Didn’t Tell, is going to be on campus in the Weaver Auditorium from 12:30 – 1:50 pm. Her memoir is a self-help autobiography of one woman’s story of living in an abusive relationship and how she found the courage to tell someone and gain her freedom. So whether you celebrate your mother, your grandmother, aunt, your favourite female activist or celebrity, make sure you let the world know how you’re going to #PressForChange for International Women’s Day on March 8th.